What is an Inverter and Battery system? It converts 12 or 24 volt DC power from batteries to 110 or 220 AC power. A house in Afghanistan can be wired to have 24/7 electricity. 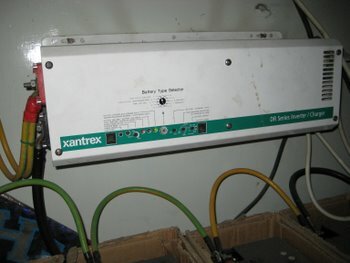 We were very happy with our Xantrex Trace Inverter (model DR1512E). It not only inverter our battery bank, but kept the batteries charged when the generator or the city power was available. We've seen people invert their entire house lights system with this method. We purchased a smaller fridge and efficient washer. My husband wired the chest freezer, fridge, washer, office and lights on the inverter. No matter what was happening with Kabul's electricity, we usually had it and always had internet and Skype. This was good for our security - in times of unrest, the internet stayed up and we could communicate by Skype. We added several solar panels to assist the effort to keep the batteries charged up. Our inverter battery system cost $500 for the inverter, $700 for the batteries, and $700 solar panels. The batteries lasted easily for 2 years, and were sold for $20/each at the end of 2 years. There are many different variety of inverters. Kabul has many shops now providing good quality imported inverters. You can expect to pay between $200 and $1000 depending upon the capacity of your inverter. We recommend deep cycle sealed batteries because of their maintenance free simplicity and durability. Deep cycle batteries can be purchased in Kabul for approximately $1/amp. A 70 amp battery would cost around $70. Regular lead-acid batteries are less durable but cost only $0.50/amp. 150 amp truck size battery would be about $75. Most stores that sell inverters and solar equipment are able provide installation services. Koa-Marquaz, Pul-e-Surkh are two areas we know of in Kabul which sell these items. It is important to not operate high electrical loads through your inverter. This includes hot water heaters, iron, vacuum, etc. The cleaning lady or man must be taught not to plug any high-load equipment into a socket which is wired to the inverter.